Last night Mizuka and I attended the Focus For Change gala benefit for WITNESS in NYC hosted by Peter Gabriel and Angelina Jolie. 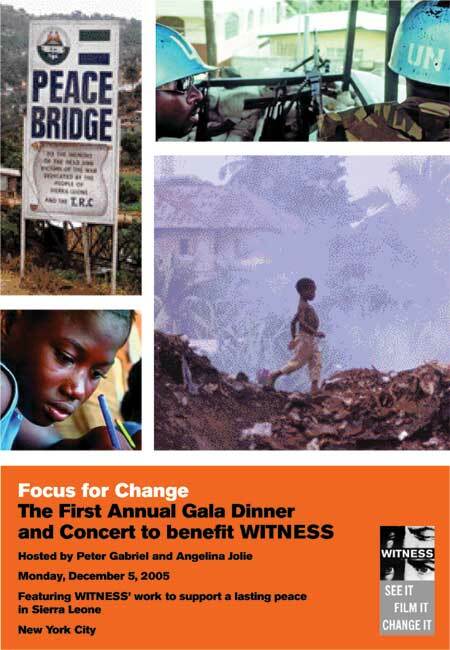 I first became interested in WITNESS when I met Gillian Caldwell the Executive Director in Davos in 2004. I started talking to her about blogging then. I helped Gillian get her blog set up when she and Angelina Jolie were headed off to Sierra Leone to deliver the Truth and Reconciliation Commission's recommendations to the government in May. The blog was a success. We've been talking about other ways to use the Net. She invited me to attend the Gala last night which was an amazing event. The videos and comments from Peter Gabriel, Angelina Jolie and Gillian were awesome and inspiring. However, the main event for me was Ishmael Beah, a former child soldier from Sierra Leone. He talked about how his life started as a happy kid who played soccer in the streets. As the war swept across the country, he survived the loss of his family and fled from village to village as he watched them being ravaged by the war. He eventually ended up being recruited as a child soldier. He was able to leave the military and attended college and appear before us last night to express his hope for lasting peace in Sierra Leone. It was an extremely well delivered and moving speech and really highlighted the strength of the words of a witness. In total, the event was the best fund-raiser gala sort of event that I've ever attended. It had a clear and moving message and vision, it was fun and it was extremely well executed. Congratulates to everyone involved. What exactly does WITNESS do? Where can I find out more? Interesting and worthy project... and I am curious what Lou Reed put on that nano! It's realy good human rights program that attracts the eyes of the world and inspires those who see - to act. Ching Chiao :At you all albums Peter Gabriel? 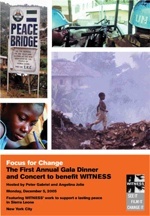 Listed below are links to blogs that reference this entry: WITNESS Gala. Joi Ito - "WITNESS Gala" by Joi Ito is licensed under a Creative Commons Attribution 4.0 International License.